Barcelona beat Juventus in the final of 2015 UEFA Champions League where Rakitic scored the opening goal in just 4th minute but Juventus pegged back with a equaliser through Morata. But Luis Suarez goals in 68th minute and than a late late third goal by Neymar sealed the fourth Champions League title in last 10 years. This was Barcelona’s 5th European title and 4th in last 10 years making them the most successful team of this century. 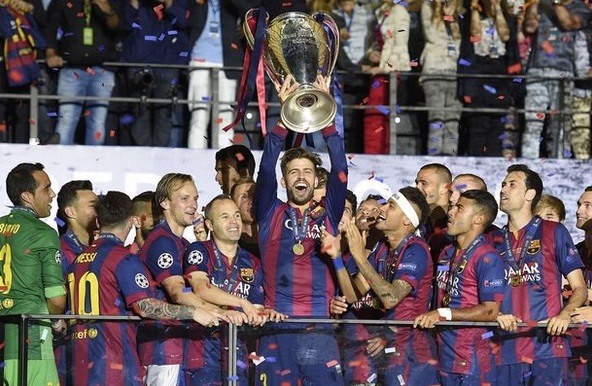 The season ended superbly with champions league win making it three major trophies this season as Barcelona had already won Spanish La Liga and Copa Del Rey. FC Barcelona players arrived back in Barcelona and took part in the treble success parade in the city where thousands of local Barcelona fans had gathered. Barcelona players and staff parade through the city with open bus and fans were their to cheer their team’s success. Players took turns to express on the 2014-15 season. Perfect ending for Xavi’s Barcelona career as he bows out with his 4th Champions League win with the club and also won 8 La liga titles and 3 Copa Del Rey. Players like Gerard Pique, Sergio Busquest, Iniesta and Dani Alvez has been ever present in the team along with probably the greatest footballer of all times in Lionel Messi. Barcelona dominated the possession against Juventus in the final and looked the better team throughout apart from few minutes When Juventus scored and looked like a threat afterwards. Channels: SkySports1 (UK), FoxSports (USA), SportsNet (Canada), ESPN3 (Australia), TenSports (Indian Subcontinent), Middleeast & African countries (beIN Sports), Scandinavian Countries (Viaplay) and major local sports channels in european countries. 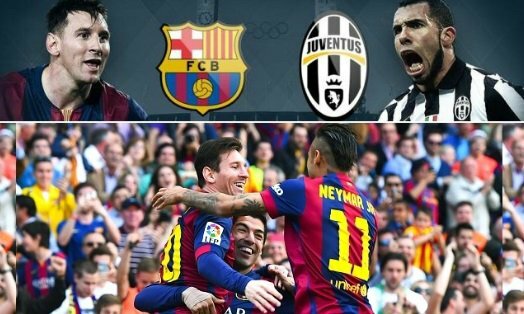 Match Preview: FC Barcelona will be taking on Juventus in the 2015 Final of UEFA Champions League which is a flagship european club tournament. Lionel Messi, Neymar and Luis Suarez will be leading the line for hot favourite Barcelona to complete the treble while Juventus dont have as much star power as Barcelona but they have been the best side in Italy for best part of last 5 years winning 4 back to back Serie A titles and going into the final match with a chance to complete treble having already won League and Italian cup titles. The match on Saturday, 06 June 2015 will be shown live in almost all countries around the world. You need to check your local TV listing what channel is show final in your part of the world. I enjoyed watching the game in this site.there were not problems with the streamer!